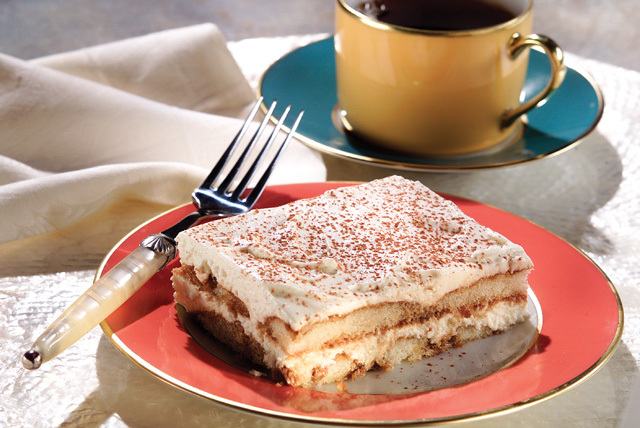 Skip a trip to Italy (or the local bakery) and make this creamy PHILADELPHIA Tiramisu at home. This creamy PHILADELPHIA Tiramisu is the perfect dessert! Arrange 1 pkg. of the ladyfingers on bottom of 13x9-inch dish. Dissolve instant coffee and 1 Tbsp. sugar in boiling water. Brush 1/2 cup of the coffee mixture over ladyfingers in dish. Beat cream cheese with electric mixer on medium speed until smooth. Add 1/2 cup sugar and liqueur, mixing until blended. Gently stir in whipped topping. Spread one half of the cream cheese mixture over ladyfingers. Top with remaining ladyfingers; brush with remaining coffee. Spoon remaining cream cheese mixture over ladyfingers. Dust with cocoa. Refrigerate 4 hours or overnight. Substitute 1 pkg. (10-3/4 oz.) frozen pound cake, thawed and thinly sliced for ladyfingers. Place 1/2 cup mixed berries on plate with dessert to add color to your presentation.